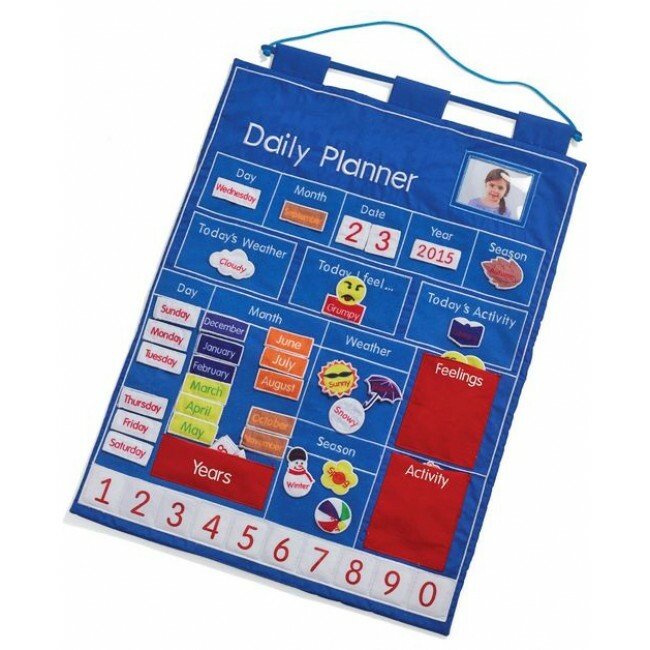 Popular in homes and schools, this interactive educational calendar provides plenty of daily fun and learning. This wall chart is of the highest quality and the hand crafted pieces can be easily removed and replaced and includes pockets for storage. The calendar includes days, dates, months, years , weather and seasons. There is also a picture pocket for a child's portrait. This updated version also includes feelings and activities. Children can place a daily feeling on the chart and also a daily activity. Feelings include 8 illustrated choices and four blank pieces which can be drawn in using felt pens or coloured permanent markers. The addition of feelings allows children to express themselves through a drawn face, if they can't find the words. There are also four blank pieces for the daily activities; so that each child can add their favorite hobbies, sport or activity to the 8 pre sewn pieces. The wall hanging looks great on children's bedroom walls and will help children learn numbers as well as reading the names of calendar days and months. Colours and design may vary.